Have you ever noticed that red is the favorite color for a barn? 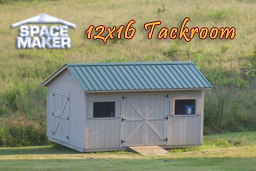 Perhaps you've thought about building sheds in your yard for things like storing pet supplies or other storage and painting them red in the tradition of the barn. Of course, we provide customized color selections, in case you need to designate another color for your order. 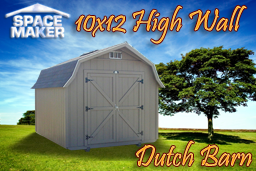 Instead of going to the trouble of piecing it together yourself, you could simply invest in an 8x12 Dutch barn that is already painted and ready to go. 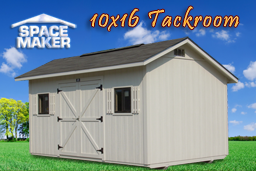 A building of this size is perfect for a number of applications, including storage for your swimming pool supplies, a small garage for a motorcycle or 4-wheeler that doesn't fit in your 2-car garage, a place to keep your pet supplies, or other miscellaneous storage purposes. There's no need to concern yourself with creating a structure yourself, with this and other plans available and customizable for your use. 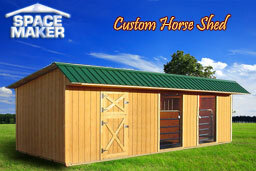 In fact, we can even custom build a completely different design if you don't find exactly what you're looking for. 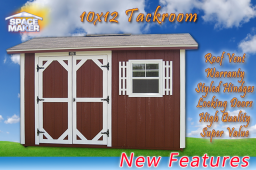 However, this 8x12 red barn is a perfect, small application that won't overtake your real estate with its size. Insulated roof decking that incorporates 25-year shingles (metal available as an option, as well) and extended overhang to help protect all four outer walls from the elements. Western Fir siding that uses a baked on primer to make sure that gorgeous red paint has an extended life. Solid 4x6 pressure treated runners braced with 2x4 floor joists on 12-inch centers. This is all topped with plywood decking that has been sanded down to a smooth finish. Design elements can be specified to your liking, including the addition of shelving for your swimming pool or pet supplies, windows where you like, and shutters to protect your items from too much sun and the windows from inclement weather. Whether using the building to house swimming pool supplies or as a garage for small vehicles, you can assure the protection of the items inside. You can count on the construction of this stylish Dutch barn, as well, with sturdy flooring. With a double door entry and so many elements that you can specify to your desire, why would you ever build your own shed? 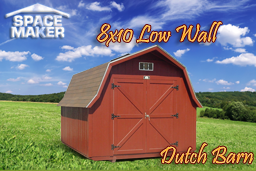 The 8x12 Dutch barn is perfect for any purpose and looks great without any work on your part.